For easy and efficient composting, yard trimmings can simply be stacked into piles. Leaves, grass clippings, twigs and weeds (except ones that have gone to seed or spread by runners, such as Morning Glory or Buttercup) can easily be added to a pile as they are collected from the yard. It is not necessary to add fertilizer or compost starter to a pile because all the ingredients needed for composting are already in yard trimmings. 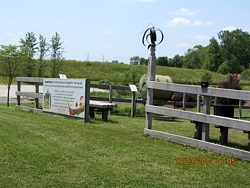 A tidier composting method makes use of holding bins, simple structures that surround and confine compost piles. Bins can be made with wire mesh shaped into a ring or from wooden pallets fastened together to form a square. Bins are also sold at local lawn and garden shops. Harvesting the finished compost from a pile or holding bin is easy. After waiting six months to a year for the yard waste to fully decompose, remove the bin and set it up again nearby. Starting at the top of the pile, remove any recently added material and either place it into the relocated bin or use it to begin a new pile. When you reach material that resembles rich soil, remove it for use in your garden. Large branches and other under-composed trimmings should be pulled out and shredded for further composting. Adequate watering - Lack of water is the most common problem for most home composting. Composted materials should be moist, but not dripping wet. Cover piles with dark plastic or tarp if your compost is drying out. Balanced Nutrients - Compost organisms thrive on a 1:2 diet of nitrogen and carbon. For rapid decomposition, mix one part of nitrogen-rich green wastes, such as grass clippings, with two parts of carbon-rich brown wastes, such as dead leaves or corn stalks. Aeration - A steady supply of air is required for efficient composting. Turning or mixing a compost pile will help air reach the center. A wide variety of multiple-bin composting systems and rotating drum composters are available to simplify turning the compost. A pitch fork also works well. 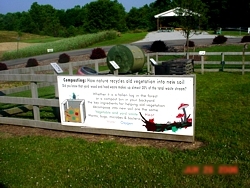 You can also visit Home Composting Made Easy for more helpful tips on composting! Place mulching mower blade on your existing mower. Cut your grass high and allow clippings to remain on your lawn. Grass clippings are free fertilizer; allow them to work as such. Cut more frequently, it will minimize the need for raking.